BITING. Cougar wins. Now I’m not suggesting that being bitten by a bear would feel good, but using the principal of simple leverage, the cat’s bite would be more efficient. The load (pressure near the front of the jaw) is much closer to the fulcrum (the pivot pt. of the jaw) because of its short snout. This explains how a 100-pound cougar can clamp onto the neck of an 800-pound elk and ride it out to the elk’s demise. In this way, the profile of the cougar’s skull is much like the talons of a raptor. SIGHT: Cougar wins. Notice the big difference between the size of the eye sockets in the two skulls. Bears have beady little eyes and have long been considered to have poor eyesight. But remember, poor eyesight in the bear world is like good eyesight in the human world. ROOTING: Bear wins. You can see that not only a longer snout, like that of a pigs, is beneficial in rooting under logs and in holes, but the row of front teeth of the bear actually protrudes forward; much beyond the canines. This also will allow the bear to clip vegetation more efficiently than the cougar. TAKING A HEAD SHOT: Bear wins. 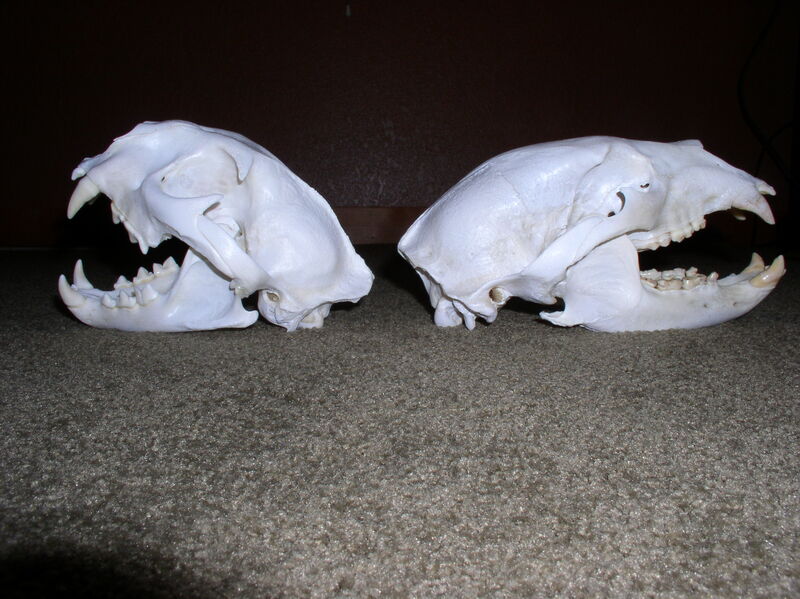 When comparing the profile of the two skulls, look at how the bear’s skull creates a long, gently sweeping arc; all the way from the front teeth to the back of its head. 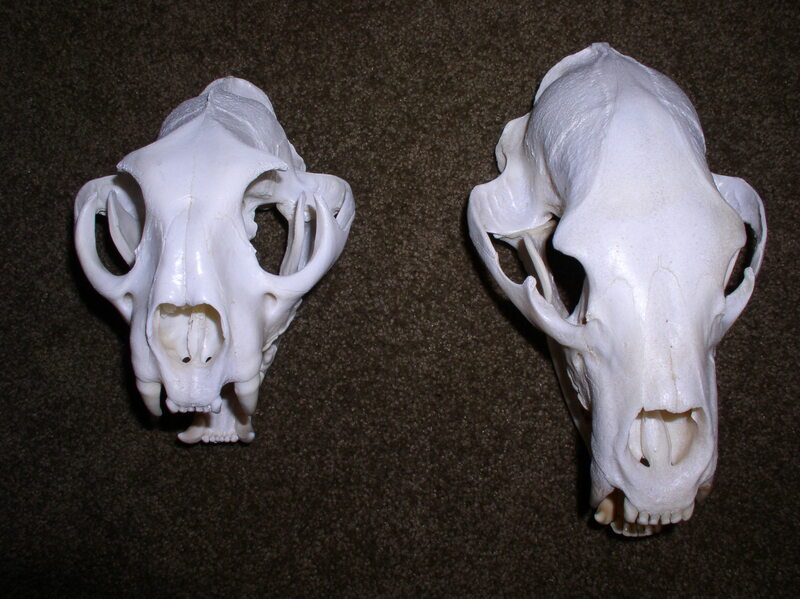 The cougar skull, on the other hand, is much more squared. So what? Imagine being face to face with either, and you just have one bullet. I’d think twice about firing a bullet at the bear’s forehead, because of its curved shape. We’ve all probably heard by now that even a large-caliber rifle round can simply ricochet off the forehead of a bear; now I know how this can be true. CHEWING: Bear wins. 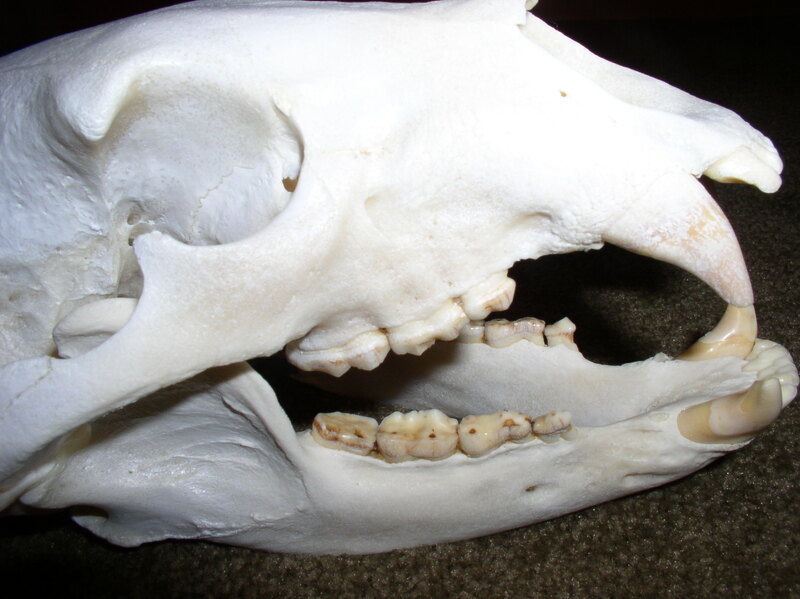 Aside from the longer fangs, the bear’s teeth are very similar to those of humans. Note the molars. As omnivores, humans are equipped to eat both meat and vegetables. The bear is no different. Depending on location, vegetation can be the greatest part of a black bear’s diet. TEARING: Cougar wins. Upon inspecting the cat, I noticed that the incisors are remarkably like shark teeth, and it lacks true molars. This tells me that cougars more often cut and swallow, as opposed to chewing like a bear. 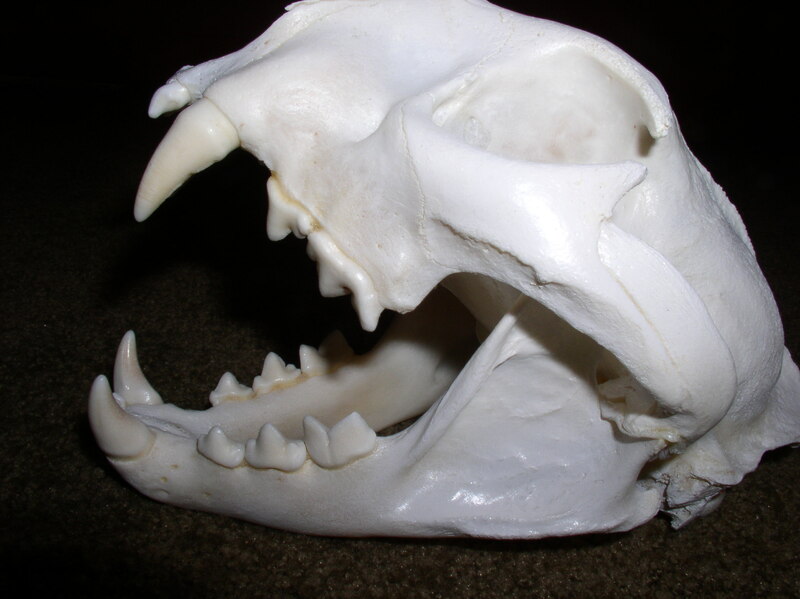 It also demonstrates how a cougar can cut and tear all the way through the bite, and in most areas of the mouth. This is a well-equipped animal-killing, meat-eating machine. Both of these predators are well-equipped to take man out in an instant. The good news is, they most often don’t want to; very good news for those of us who hunt where they live. So the next time you have the opportunity to look at the skull of your trophy, take an extra minute. Don’t just dismiss it as a cool knick-knack; learn from it, and carry this knowledge with you to the field. You never know, it might just come in handy some day.